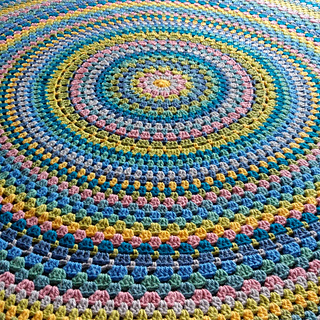 A large circular throw - a cross between a mandala (a crocheted circle) and a lap blanket or lapghan. The name blandala sounds fun too. 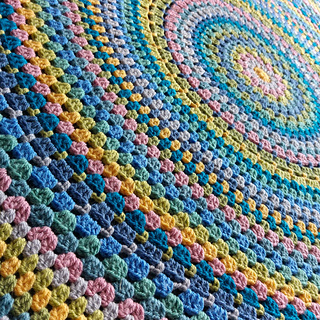 Crocheting a circle is easy if you don’t have to work out the calculations on increases. 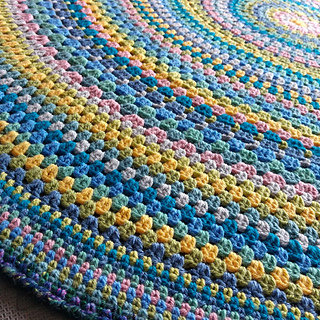 This pattern provides round by round instructions so that you can crochet a very large yet still flat circle. A change of colour each round makes it lovely to look at and the Stylecraft Special Aran is quick to work up and lovely and soft and snuggly. The colours used in the Stylecraft Aran are Saffron, Pale rose, Silver, Sage, Storm blue, Aster, Pistachio, Meadow, Denim and Empire with the Paris colourway from the Stylecraft Carnival Chunky range used for the last three rounds of the border. This is a quick and easy blanket to make and suitable for less experienced crocheters. It will help if you have crocheted a circle before - a coaster sized one is fine! The overall diameter when finished is just under 5 feet (60 inches, 150cm). Any aran weight (heavy worsted) would be suitable too and, of course, you can make the blandala using any 10 colours of your choice.